ASR ELEV, 781.8 FT. CPME #1 41-26-47.022N 81-30-16.109W. CPME #2 41-24-41.226N 81-50-19.868W. MTI RY 18 41-25-06.411N 81-50-53.712W. MTI RY 23L 41-25-15.778N 81-49-58.686W. MTI RY 05 41-23-48.482N 81-52-16.691W. A110-1 DEER & BIRDS INCLUDING WATERFOWL ON & INVOF ARPT. A110-26 NASA GLENN RESEARCH CENTER; NASA RAMP PPR CALL 216-433-2020; 0800-1730 MON-FRI. CONTACT NASA OPNS ON FREQ 122.925 WITHIN 50 NM. A110-3 ADCUS AVBL MON-SUN 0800-1800; ALL REQ FOR SVC MUST BE MADE WITH THE U.S. CUST SVC OFC LCTD AT GATE A-14 CALL (216) 267-3600 DURG LISTED HRS. A110-32 PAD 2 AND TAXILANE Y1 RSTRD TO GROUP II ACFT LESS THAN 79 FT WINGSPAN. A110-33 ALL APCHS ARE OVR NOISE SENSITIVE AREAS. ARPT LATE NGT NOISE ABATEMENT PROCEDURES ARE IN EFFECT 2300-0600. ADDITIONAL NOISE ABATEMENT PROCEDURES ARE IN EFFECT CALL AMGR NORMAL BUSINESS HRS AT 216-265-6090. 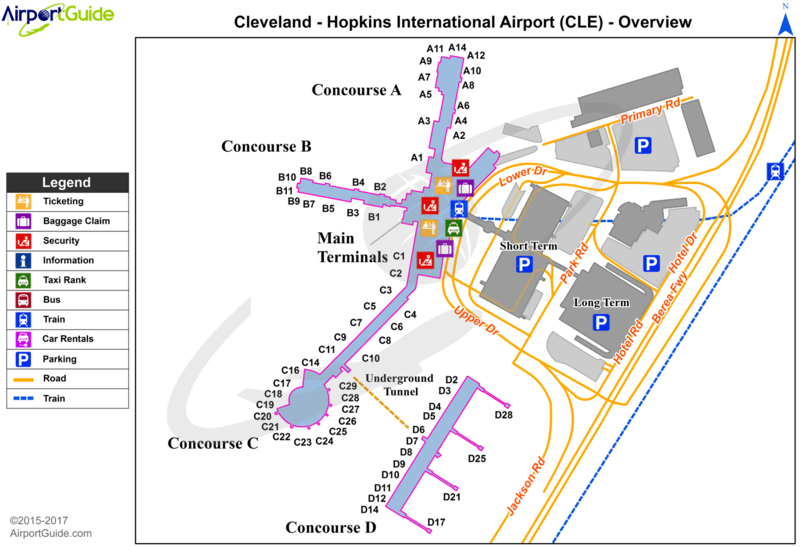 A110-36 THE FOLLOWING TWYS ARE CLSD ANNUALLY FR 15 OCT THRU 15 APR TO SUPPORT DEICING OPNS AT CLE: TWY M; TWY M1 BTN TWY L & TWY J1; TWY M2 BTN TWY L & TWY J1; TWY J2 BTN TWY A & TWY K.
A110-37 RAMP AREA CONCOURSE D BTN GATES D1, D28 CLSD EXC ACFT WINGSPAN LESS THAN 86 FT.
A110-39 CONCOURSE C RAMP TAXILANE BETWEEN SPOT 2 AND SPOT 5 CLOSED TO ACFT WITH WINGSPAN 118 FT AND GREATER. A110-40 PAD 3 BAYS 1-5 CLOSED TO ACFT WITH WINGSPAN OVER 134 FT.
A110-41 PAD 3 BAY 6 CLOSED TO ACFT WITH WINGSPAN OVER 94 FT.
A110-42 ASSC IN USE. OPERATE TRANSPONDERS WITH ALTITUDE REPORTING MODE AND ADS-B (IF EQUIPPED) ENABLED ON ALL AIRPORT SURFACES. 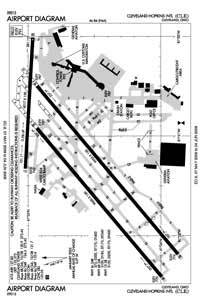 A50-06L RWY 6L ALSO HAS LGTD PLINE 99 FT ABV RWY END, 4266 FT FM RWY END, 966 FT L OF CNTRLN, 41:1 OBSTN CLNC SLOPE. E60-10 EMAS - ENGINEERED MATERIALS ARRESTING SYSTEM, 170 FT IN WIDE X 275 FT LENGTH, LOCATED AT DEPARTURE END OF RY 10. E60-28 EMAS - ENGINEERED MATERIALS ARRESTING SYSTEM, 170 FT IN WIDE 365 FT IN LENGTH, LOCATED AT DEPARTURE END OF RY 28. Single Wheel Landing Gear: 155.